The recurring themes of being a freelance photographer. "It's too busy." "It's not busy enough." "I have way too much in accounts receivables and way too little in cash." "I just bought a new camera bit I wish I'd waited for the one they just announced." The market for commercial photography, at least as it relates to me, is crazy and constantly changing but on the other hand it feels constant and unchanging. Let me explain. 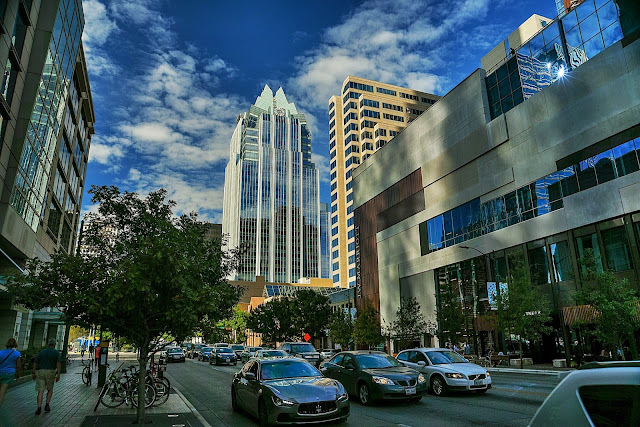 Austin is growing at the speed of light. People are moving here from all over the country and most of the people moving here have higher incomes than the people who were here to begin with. That means residential property in the prime neighborhoods has been appreciating like Apple stock. If you bought a good house in the Eanes School District (rated #1 in Texas) in 1995 for a little less than $200k you might just find that the land under your cute little house is now worth close to a million dollars; maybe more. Nobody wants your house, they want to buy your lot, knock the house down, scrape it off the lot and build their new dream home. But what this means in a bigger picture way is that the city is becoming prohibitively expensive to live in or invest in for normal, middle class people. Say, freelance photographers making less than $100,000 per year. If you are moving into the market you are either coming with money or you are doing the old fashion, California living accommodation by renting or buying something miles and miles outside the magic ring of the actual city of Austin where all the value is and all the cool stuff happens. It would, I guess, be a workable strategy if not for Austin have the "honor" of currently having the 4th worst traffic congestion in the country. A drive in from Pflugerville or Cedar Park during any of the ample and assorted rush hours might have one driving for several hours in order to make it into the real city and back out again. Much worse if someone rolls a big truck on one of the major freeways. But consider your plight even if you were lucky enough to buy at the right time (twenty years ago?) and you live within three miles of downtown. You might now have a property worth a cool million, which is also highly liquid right now, but if you sold it where would you move? Everything else in the desirable zones is equally inflated and rising quickly. So maybe you just decide to keep sitting on all that equity and have fun in place. Good plan in most states but in Texas, where there is no personal income tax, the state fills the coffers mostly with property taxes. And ours in Austin are some of the highest in the country. That million dollar property looks good when you consider the "sell side" but the "stay put" side is scary because every year your property taxes are likely to go up by about 10%. We are just about to the point where our property taxes will "jump the shark" and cost more each year than our mortgage. The popularity of the city and the increase in population don't necessarily translate into higher rates for freelancers; in fact the popularity of the city among the nation's educated young attracts lots and lots of newly minted photographers who shift the supply and demand curves in the wrong direction. Add to that the increased time cost of doing business in a crowded and thriving metropolis. What used to be a leisurely twenty minute drive up Mopac to a job site in the "tech central" part of town is now an hour or more in the rush hour parts of the day. The time of the day when businesses get started and expect photographers to start as well. Once you hit your destination you'll find that the ample, free parking we used to enjoy outside of the downtown area is shrinking faster that the water supply in Lake Travis. After your slow and plodding commute you'll be circling the periphery of most locales looking for that rare parking place. Wanna park in the shade? Good luck. Of course, you have to do it all in reverse to get back home. One Summer in Austin the ambient temperatures were so high and the commutes so slow and plodding that a record number of car batteries just "gave up the ghost" that season and died off. Part of the cost of popularity and an excessively mobile culture. You'd think with the sheer momentum of grooviness and hipster culture in town that photography rates are sky-rocketing but, perversely, we still see our city as a "second tier" creative city and rates have stagnated for years. Big clients still head out of town for "name" photographers for many of the big and juicy advertising projects. The local agencies are being beaten up by clients taking creative and marketing totally in-house and are passing the fear and budget cutting along to their freelance collaborators. I can almost feel the pulse of industries by the way, and on the schedules, they devise for paying their bills. In times of rising industry fortunes there's no need for bids and the checks arrive sometimes before we can even get a bill out the door. Last year we had a couple of clients who wanted to "pre-pay" for a series of projects just to get the paperwork out of the way. This year you can tell that everyone is a bit nervous and hesitant. Checks seem to take more circuitous routes to the mail box and the stories are being reprised about accounting departments being sidetracked by: "the audit, the payables software change, and my new favorite: "We use an outside service to generate payments --- let me check on that and get back to you." My least favorite new response is: "We're splitting the cost of your invoice with two partners and one of them is part of holding company in the U.K. It always takes longer for us to get checks from them......" I didn't even know that secondary companies were part of our contract. Silly me. So, taxes, expenses, time costs and competition are all up while rates are static; and so what's really new? Well, even as recently as a couple of years ago there was at least the certainty that we knew how to make and deliver our core product. Even though we might love buying new cameras and stuff there was always the underlying and comforting reality that our clients didn't really drive equipment acquisition and we probably could get another season or two out of this or that camera system. If economic push came to shove. Funny how it's changed. To maintain income and keep traditional clients we've been doing more and more video projects. That necessitated buying new cameras that could crank out good video footage and were agile enough to use for multiple roles. It also required investments in microphones, faster computers, new software, and new ancillary gear. But it's changing quicker than is comfortable. A year or two ago we downplayed the idea of 4K in our video inventory but now clients want it for reasons other than showcasing their programming on 4K monitors. They are now asking for things like "vertical edits" which are better handled with 4K. A recent client wanted video that would go 2560 pixels wide in a super narrow aspect ratio (that's a blow up from 1080p) which also is going to look a lot better from a 4K original. Clients are learning that by shooting wide in 4K we can do a lot of very smooth movements in post instead of riskier movements during shooting with sliders, dollies and hand held rigs. There's much more "after the shot" flexibllity in the final edit with a lot of extra space around the live areas. Heck you can zoom in by a factor of 4 and not run out of pixels if you are aiming at delivering a 2K final product. I learned the interesting way just how nice it is to start with a widely composed 4K video file if you are planning to make extensive use of software stabilization in your editing. The programs analyze your clips and map the range of motion. They then crop to the maximum range of motion for the entire clip. You lose tons of top and bottom space when stabilizing a jumpy (handheld?) clip. If you start with 4K, then stabilize and then crop to your wacky aspect ratio, with good pre-planning, you may lose nothing you wanted included. So during a time of escalating costs in nearly every part of the business we add on the ramp up of a video market that's also diffusing quickly into the general market. I'm happy when I'm in the vacuum of working with my Nikon D750 and D810 and I'm not nosing into websites about new gear. But then I get distracted by something like the Sony A7R2. I don't particularly like that camera but I do like that it shoots really, really nice 4K video internally. Will my clients need this? Sure. Are there other options? Absolutely. But how do you make the right choices and how long do you wait to buy and start servicing the market with new technologies? Wouldn't it be wonderful if you were privy to the plans of your camera maker? If I knew that Nikon was launching a new camera with 4K video at the Photo Expo in October then the whole issue could be sidelined (and the savings started) until I got my hands on the new product. All of which is predicated on getting checks from those folks who are "being audited, learning new software and waiting on slow boats from merry old England." The biggest issue facing me in the business right now is in marketing. Not just what to say but where to say it and to whom. The flux in the industries we work for has accelerated to a speed that's faster than I've ever seen it. People seem to be moving between companies on an almost monthly rotation. I think about all this today from my position of "man sitting in chair waiting to be paid" but by the middle of the coming week, and for the rest of the month, I'll be ruminating from the position of "man in transit from project to other relentless projects." I have two weeks of broken and inefficient travel coming up and I'm as much of a curmudgeon about that these days than I am at dealing with sociological change. To keep from going nuts I'm distilling it all down to this: Change is inevitable/stay flexible/play to your strengths but develop new strengths/everything you do is marketing/Nikon will come out with 4K just in time/all marketing works if it's targeted correctly/Don't sell a house if you don't want to move/pay your bills and your taxes and be grateful/keep swimming & keep shooting. = that's the good stuff. And in the end we always looking for that evasive "extra". For me it's to have the time and energy left over from making a living to play with photography and video for fun. I think it's still working.